I've wanted to play around with the ADXL202 acceletometer ever since I first saw a DIY self-balancing robot on the web. 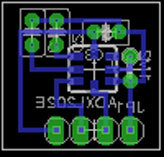 The ADXL202 accelerometer comes in an incredibly small component package. So small that it at first scared me from trying to solder it onto a board. A few months ago I bought me a nice and small soldering iron with a tip not much larger than a bulletin board pin, so now it's time to make a break-out board for the accelerometer. Along with the accelerometer there is mounted 3 capacitors and a resistor. The resistor defines the output signal frequency. I used a 1.2 megaohm resistor, giving me a frequency of around 15 ms pr. cycle. The last capacitor, C3, is used to dampen noise on the logic supply signal to the accelerometer. That's about it. 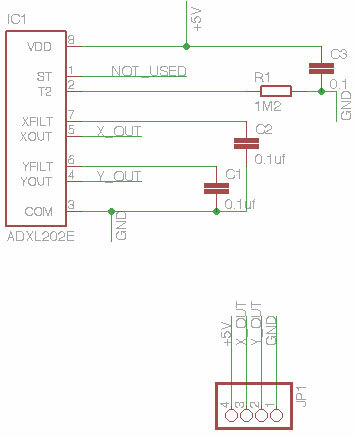 Get on soldering and start playing with the ADXL202 accelerometer. It's a super cool and easy sensor to include in your next project!